Years ago, there was a very wealthy man who, with his devoted young son, shared a passion for art collecting. Together they traveled around the world, adding only the finest art treasures to their collection. They owned priceless works by Picasso, Van Gogh, Rembrandt, Monet and many others adorned the walls and rooms of the family estate. The elderly man had lost his wife earlier in life, so his son was his whole world. They traveled the world attending art shows and auctions together. The widowed elder man looked on with satisfaction, as his only child became an experienced art collector. The son’s trained eye and sharp business mind caused his father to beam with pride as they dealt with art collectors from around the world. It was a joint endeavor that brought them very close. But things soon changed for the young man as our country went to war. War engulfed our nation; the son was drafted, and left to serve his country. The father anxiously waited day after day to hear from his son after he was shipped overseas to the war front, but a letter never came. After a period of some weeks, his father received a telegram. His beloved son was missing in action. The old man anxiously awaited more news, heartbroken and fearful that he would never see his son again. Within days, after receiving the telegram, there came a knock at his front door. As he opened the door, there stood a soldier at attention. The soldier informed him that his worse fear was now confirmed. 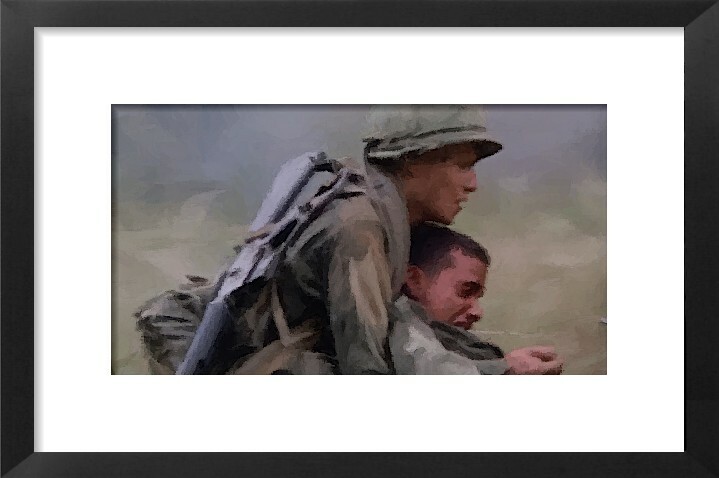 While under heavy enemy fire, his beloved son had rescued a fellow soldier that was wounded, pulling him out of harms way trying to get him to safety. He was trying to reach a medic to care for the man’s wounds. But in risking his life to save the man, he had exposed himself to heavy enemy fire. Even though he was able to get the wounded soldier to safety, the wounds he received as a result were to severe for him to survive, and he had died, shot through the heart. The old man stood in silence for a moment, he felt his body go limp, his heart sank in his chest, and then he slowly closed the door. Distraught and lonely, the old man faced the upcoming Christmas holidays with anguish and sadness. The joy of the season – a season that he and his son had so looked forward to – would visit his house no longer. On Christmas morning, a knock on the door awakened the depressed old man. As he walked to the door, he walked by all the masterpieces by Picasso, Van Gogh, Monet on the walls in the hallway. They only reminded him that his son was not coming home, and they would never share their love of the arts together again. As he opened the door, he was greeted by another soldier. This soldier had a large package in his hand. He introduced himself to the man by saying, “Sir, I was a friend of your son. I was severely wounded in battle, I was trapped. Your son risking his own life, came and rescued me. If not for him I would have perished. I am the one he was rescuing when he died. The old man stood, weak in the knees, tears in his eyes and looked at the young man, and asked him, “So you knew my son”? “Yes” indicated the soldier, “I knew him well”. The soldier then said to the broken-hearted father, “May I come in for a few moments? I have something to show you” “Yes, yes, please come in“, said the old man…As the two began to talk, the soldier told the old man how his son would always tell stories to all of his friends of he and his father’s love of fine art. “I’m definitely not a great artist,” said the soldier, as he handed the old man the package, but I painted this myself and I want you to have it”. As the old man unwrapped the package, the paper gave way to show a portrait of the scene of the old man’s son, carrying the wounded soldier, pulling him to safety during the heat of the battle. The battle in which he had lost his life. Though the world would never consider it the work of a genius, or that of even a decent artist, the painting featured the young man’s face and courage during the battle in striking detail. A few hours later, after the soldier had departed, the old man set about his task. True to his word, the painting went above the fireplace. He pushed aside hundreds of thousands of dollars of paintings, and put the picture of his son in their place. And then the man sat in his chair and spent Christmas gazing at the gift he had been given. During the days and weeks that followed, the old man realized that even though his son was no longer with him, his boy’s life would live on because of the lives he had touched. He would sit and watch the scene where his son gave his life in sacrifice to save another. As time passed, more and more stories came to his attention, as many other soldiers contacted him and told him that his son had rescued them also and carried them to safety when they were wounded. The stories of dozens of wounded soldiers saved by his courage came to light before that fatal moment when a bullet stilled his caring heart. As the stories of his son’s gallantry continued to reach him, the old man’s fatherly pride and satisfaction began to ease the grief and heartache he had suffered. The painting of his son soon became his most prized possession, far eclipsing any interest in the pieces for which museums around the world pay dearly for and collectors clamored for. He told his friends and neighbors it was the greatest gift he had ever received. The auction began with a painting titled simply “The Son”. It was a painting that was not on any museum’s list, or on the list that any of the buyers had. It was the painting of the old man’s son. Those in attendance looked around in bewilderment, what kind of joke is this they wondered. This painting is obviously of no value, it is garbage, they said among themselves. It is of poor quality, very amateur to say the least. The auctioneer asked for an opening bid. The room was silent. “Who will open the bidding with $100 for this painting?” he asked. Minutes passed. No one spoke. From all around the room of the shouts came, “Who cares about that painting, it is not even a decent painting, it is of very poor quality, by an unknown artist, and it has no value whatsoever. It is not worth anything. It’s just a picture of his son at war. Let’s forget it and go on to the good stuff, no one here is interested in that. More voices echoed in agreement. “No, we have to sell this one first,” replied the auctioneer. The auction resumed. “Now, who will bid on this picture said the auctioneer?” Over and over he repeated the same phrase, “Who will bid on this picture”? Finally, sitting on the back row at the far end of the room the gardener of the old man stood up and spoke. Looking first around the room at all the glaring eyes, and then at the auctioneer he said, “I am not a rich man, and I do not have much to offer”. “The father was a friend of mine, and I knew the boy”. I would love to have it, if no one else wants it, it would mean so very much to me. But I only have ten dollars,” “Will you take ten dollars for the painting, I’m sorry, that’s all I have. “I have ten dollars, will anyone go higher?” barked the auctioneer. After more silence, the auctioneer said again, “I have ten dollars, will anyone go higher?” No one else bid on the painting. “Going once, going twice, sold for ten dollars to the gentleman in the back row; please see the cashier said the auctioneer.” The gavel fell. Cheers filled the room and someone exclaimed, “Now we can get on with it and we can bid on these treasures of art. So my friends, receive the Son, and receive it all, a gift of love by the Heavenly Father, through the sacrifice of His Son Christ Jesus. Whoever takes the Son gets it all. ‹ My Thoughts on The Book Of Eli…. What a moving story. I was so touch by the contents of this story. No greater love than the father who gave his son to save his friends. There is no greater love…..
Wow, I’m deeply touched! It’s a great story ever. Truly blessed. Thanks a lot. What a surprising coincidence! Just yesterday while meditating on this story which I fisrt heard in spanish version on “Enlace”, which is a hispanic Christian Channel, and now you! Blessings from the Good Lord!! Thank you Debra….I believe you are humble of heart and God works through you to bless others.. You just blessed me! I was so moved, having read this story, by the little man with $10 and a big ole heart. It made me think the Father was probably counting on leaving his all to a soul much like the widow with her two mites. Beautiful and heart warming!!! This is a beautiful story. Brought tears to my eyes, and makes me think of all those parents who have lost a child, whether through war, or anything else. The only true comfort would come from someone who has been there. He is truly able to comfort, as He has actually experienced the sorrows of mankind. Thank you Yeshua for coming in the form of man, so that not only could we understand You, but we know that You understand us. Great story. Thanks Darrell. This blog has me weeping at this very moment. Much like that painting, for a large part of my life, I wasn’t worth much to people and often considered “junk”. But one man, Ryan Henderson, told God. “I want her. In spite of all she’s done and been through. In spite of her anger, bitterness, and tears. In spite of her brokenness, I want her.” The Lord taught me that His love for us is the same love Ryan had for me (although on a totally different scale because no one loves us like He does). And now Ryan calls me his princess and crown jewel. I don’t say this to brag because this is so not about me. It’s about God and how easily we can forget that just because something looks worthless on the outside it doesn’t hold deep treasure within. Thank you Jesus for loving me with all my flaws and short comings, and giving me a husband who took everything he had like the man with the $10 and said, I want the painting-the one that everyone else laughed at, rolled their eyes at, and dismissed. What he got at first was a lot of grief…..but now he says, I was worth it all and that he never knew when he made the decision to ask me to be his bride, that I would end up becoming a priceless and cherished treasure to him that he never would have expected. All that to say……as Christians, we still look at others and call them lost causes because they don’t fit into our world of being among the wealthiest, most intelligent, or even lazy. But all it takes is for one person to stand up and say, “This is all I’ve got, but I want them.” Once they have them…..if we really look inside of a person…..we will see and be rewarded with the “priceless works by Picasso, Van Gogh, Rembrandt, and Monet” when our initial intention and only agenda was to extend the love of God and believe in that person. The beauty of it all is that neither one will ever really know the price TRULY payed until they cross over into eternity. I’ll stop rambling now……beautiful writing Darrel…just beautiful! Ahhh, Chantelle…. the way you applied Darrell’s rendition of “The Son” to your life is priceless. Thank you for sharing your testimony and gift of your husband’s love in such an applicable way–it is touching, moving, and just like Christ’s love for us– incredible, undescribable, and unfathomable. A truly great story Darrell, really inspiring to read! I really love this well moving and deeply loving story, its the best you have ever put together. God Bless You! I have this in my “favorites” somewhere but can’t find it. It is accompanied by a lovely song by Elvis. I have forgotten the title. I have looked and looked for it. Does anyone know where to find it, or what the song is? could anyone please tell me who sings this song, i heard it on the radio the other day and it moved me very much. i would be be very greaatful. great story. It was shared at a diocesan gathering of our priests the other day. I wasn’t there but one of them told me about it so googled and found your version. Many thanks and God bless the work. Interesting but I do not see why the need to embellish the original story. It was and is heart felt and expressed the Son very well. Your application is good but please there is not always a need to embellish someone else’s story or poem. Sometimes the best thing to do is to leave alone and still give the applications. This is beautiful! I saw a movie that had this concept.. It was based on greed. A man died and they auctioned off his estate, with many paintings.. The man who had a genuine heart received it all.. but I can not remember the movie title..